This cute little cheer up/get well message from Jaco'lyn Murphy caught my eye for a few reasons. The first had to be the jars. 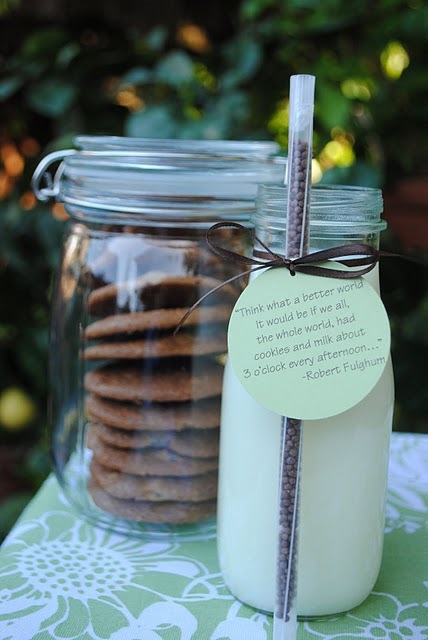 Not just the milk jar, but the cookies stacked in a mason jar. You know how I feel about jars. The second is the super clever chocolate milk straws. I need to find some of those for my kids this summer. And last, but not least...actually probably the biggest reason...even bigger than my love of mason jars...the quote attached to it all. That quote comes from his most popular book, All I Really Need To Know I Learned In Kindergarten, but I seriously love every book of his that I have ever read. I read everything he had published when I was in High School. I thought I had read them all, but I just realized that there are two new books that I didn't know about. YAY! Something to read this summer. Actually, I think I am going to go get one of them off of my bookshelf right now. So if you want something light to read this summer, try one of these books. If you need a cute gift to cheer up a friend, make one of these cute chocolate milk cheer ups.